In 1953, an Israeli delegation visited France to examine the new AMX 13 light tank. The tank was armed with a high-velocity 75 mm gun CN 75-50, a development of the German 7.5 cm KwK 42 L/70 (used in the Panther tank). While the gun was satisfactory, the armor of the French tank was considered too light. Eventually, Israel purchased the AMX 13, however in a parallel development it was decided to graft the powerful French gun onto the available, familiar and better-armored hull of the American M4 Sherman, the standard tank of the IDF armored units in the early 1950s. The project started in 1954, and in 1955 a prototype turret was sent from France to Israel. In March 1956 Israeli Ordnance Corps facilities started to convert tanks, using guns received from France. The gun was known in Israel as the M-50 and as a result the upgunned Sherman was designated Sherman M-50. The M-50 was similar to the Sherman Firefly in that it had the original turret of the "old" type (as used by the 75 mm gun M3 armed Shermans), which was fitted with a large counterweight at the rear end. The first 50 units were based on M4A4 hulls, had a Continental R-975 gasoline engine and VVSS suspension. However, the increased weight of the vehicle combined with narrow tracks led to poor off-road mobility. It was also putting too much strain on the engine, resulting in frequent mechanical failures. Consequently, for the rest of the conversions, hulls fitted with HVSS suspension and Cummins V-8 460 hp diesel engine were adopted. These subvariants were sometimes referred to as the M-50 Continental and M-50 Cummins. Diesel engines were also preferred since diesel fuel is less flammable than gasoline, which factors into battlefield survivability. (Gelbart 1996:45) In total, about 300 M-50s were built by 1964 (though it's possible that this number includes 120 155 mm self-propelled guns on Sherman chassis, also designated M-50). The same gun was also fitted to a number of M10 Wolverine tank destroyers. In the 1960s, 180 Sherman tanks received the even more powerful French 105 mm CN 105 F1 gun. The gun was reduced from 56 caliber to 44 and was equipped with a muzzle brake; ammunition was altered to use a smaller cartridge. In Israel the gun was designated M-51 and the tank the Sherman M-51. M4A1 hulls and "new" turrets (from 76 mm armed Shermans) were used for the conversion. All tanks were fitted with Cummins diesel engines and HVSS suspension. The tank was displayed to the public for the first time during the Independence Day ceremony in 1965. Abroad the M-50 was known as Super Sherman (the "Continental" variant as Mark I and the "Cummins" variant as Mark II) and the M-51 as either Super Sherman or Isherman (i.e. Israeli Sherman). These designation were never used in Israel. 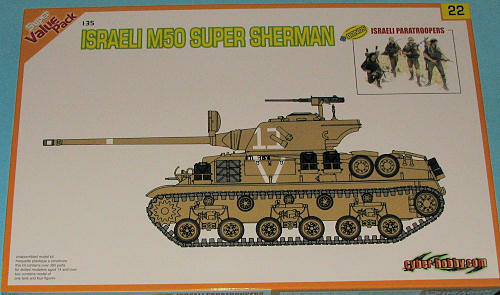 The only tank model designated Super Sherman by the IDF was M4A1 with 76 mm M1 gun and HVSS suspension, which was named Super Sherman M-1. The first 25 M-50s were finished just in time for the Operation Kadesh in the Sinai against the Egyptian Army (which also employed its own up-gunned version of the M-4, fitted with the AMX-13 turret, making it equal to the M-50 in firepower). In 1964, Israel started to divert water from the Lake Kineret (Sea of Galilee) to the Negev Desert for agricultural purposes. The Arab nations were in uproar, and Syria decided to divert water into Jordan. Maj General Israel Tal had trained Israeli tank gunners to shoot beyond 1.5 km. On March 6, 1965, an M-50 engaged a Syrian recoilless rifle that had killed an Israeli tractor driver. At such long distance, General Tal personally destroyed the recoilless rifle with his M-50. A few days later, one M-50 and one Centurion Mk III with 105 mm gun were waiting for a chance to fire upon the Syrian water diverting project. When Syrian gunners fired on a border patrol, general Tal's M50 tank and a Centurion Mk III fired on 8 tractors 2 km away, and in two minutes and after 10 shots, destroyed all of the targets. General Tal destroyed 5 tractors with his M-50's 75 mm gun, and the Centurion destroyed the remainder. Both the M-50 and M-51 saw combat in the Six-Day War that left the Golan Heights, the West Bank and the Sinai peninsula in Israeli hands, often fighting Soviet World War II-era armor like the T-34-85 (for example at the Battle of Abu-Ageila). Both were also employed in the 1973 Yom Kippur War alongside and against much more modern tanks. The use of such seemingly obsolete tanks was necessary given the desperate nature of the fighting. In combat against the Arab armies, the M-51 proved itself capable of fighting newer, heavier tanks like the Soviet-built T-54/55. The M-51's 105 mm gun could penetrate these adversaries using HEAT ammunition. The M-51 served well during its time, and is regarded as an excellent example of how an obsolete tank (the Sherman) can be upgraded beyond the limits of its original capabilities. M-50 Continentals were retired by 1972. The M-50 Cummins and M-51 were gradually phased out in late 1970s - early 1980s. Some of the M-50s were given to the Lebanese Forces, a Christian militia, and later the Israeli-supported South Lebanon Army during the Lebanese Civil War. Many tanks were sold to Chile, and some of those were fitted with 60 mm HVMS gun and are often referred to as M-60. This variant was never used by the IDF. The few M-51s that Israel retained were converted into engineer vehicles and self-propelled artillery. This particular kit is a reboxing of the Dragon Super Sherman that was quite popular amongst armor builders. This one has all the mods applicable to the M-50 including the additional bustle on the back of the turret, the French CN 75-50 gun and the HVSS suspension. New to this boxing are the superb DS tracks and the inclusion of a set of Israeli figures. Upgrading the standard Sherman kit parts requires a bit of surgery on the part of the builder, but the instruction show exactly what needs to be modified and just where all the bits go. This is particularly true of the HVSS suspension as there are no specific locators for the bogies and return rollers. 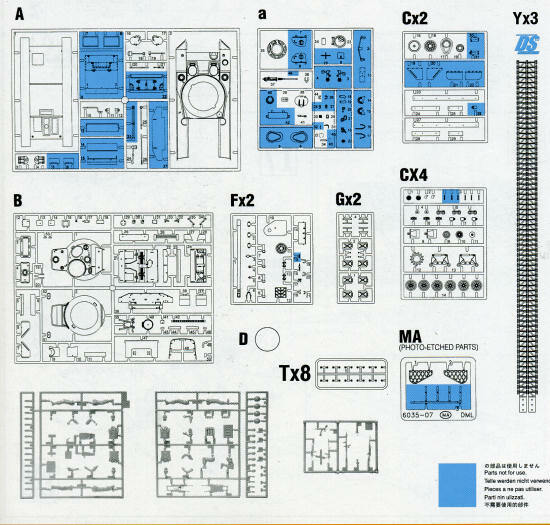 However, Cyber-hobby has clear dimensional drawings to help place things properly. Instructions are the smaller, full color versions that include a full painting and assembly guide for the figures included in the kit. A full color guide with Gunze and Model Master paints is included. One does need to pay close attention to these instructions during the build as there are quite a few modifications required to do an accurate model. Markings are for two very similar tanks from unknown units during the 1967 war. Thanks to Cyber-hobby's Value Pack line, we now have the M-50 back on the shelves and at a lower price from the original. In all, it should make for a very nice model for your next diorama or just to place on your shelf.